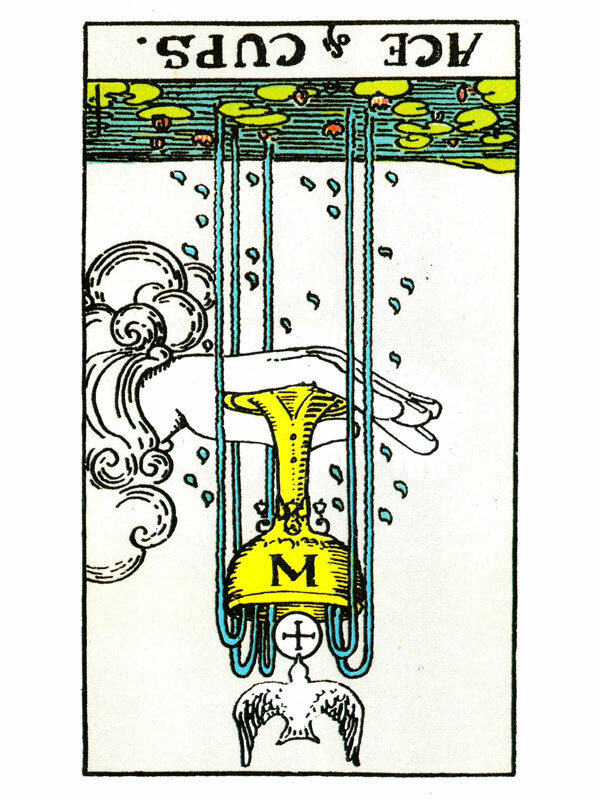 The Ace of Cups (R) represents the non-activity that is draining your energy. You are bored – you need “change” and new goals. Your life is at a standstill. You are feeling depressed, unwanted and you need a spiritual uplift. You are experiencing difficulty with a new beginning or the completion of an old emotional issue and it is creating a blockage in the heart, genital or solar plexus chakra. There may be too much of an opening or a problem with timing. You can bring about your own unhappiness by not recognizing what life has to offer you or by reacting violently when what you really need is “calm”. When it “appears” that life has turned against you – accept that problems as well as joy are a natural part of the life experience. It is time for you to allow your “Inner” Self to explore and find a purpose. Experience your emotional balance – be willing now to nurture, support, comfort and heal yourself in equal proportions to how you would nurture, support, comfort and heal another. Trust your feelings – express them openly without over-extending or over-protecting yourself emotionally. Demonstrate your love with a clear, trusting, open heart. What is making you feel good right now? What would you like to do to indulge yourself? What or who is offering you nurturing or love? What messages are you receiving from dreams and visions? What does your heart feel most open to? Swords on all sides: Present conditions in your home have not been settled. Next to Wheel of Fortune: Your financial affairs will improve now – there will be additional income. Next to Lovers: Expect a definite improvement in your family affairs. In the first position: Creative drive, feelings may be so profound that acceptance and expression are difficult. This includes the “problem” of being too attractive – to people, to information, etc. In the second position: Difficulty moving forward, a block with an emotional or creative beginning or completion. Physical matters have been too subordinated to the emotional. Check suitability of all inner influence, such as from guides, past lives, readings and the like. 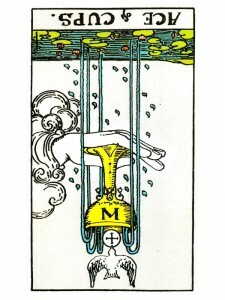 In the third position: Allow for time to take its course with emotional matters, for the energy you require to build up. This suggests the need for patience if you have been trying to push an issue. On the other hand, if you have been laid back or far too passive, the suggestion could be the opposite and you may need to move more quickly and aggressively. Give where love is needed. Take where love is offered. In the fourth position: Innocence, leading to a falling in love that is not advantageous. Possibly overly affected by the ideal of universal love or by some form of external input, less appropriate to this Karmic Contract. Caution – the love of giving must be balanced with the love of receiving. Examine motivations for wanting to be a “source”. In the fifth position: You may be concerned with or actually causing a delay with a relationship or your creative potential. How do you begin? A review and clarification of motives may be at root. In the sixth position: Flood of emotions. Your evaluation of your relationships or of your creativity, may be at odds with that of others. Be fair with yourself and others. In the seventh position: Guard against a fear of love, of happiness. Learn here to accept what is at hand. In the eighth position: Energy in situation may be too great or inappropriate. Difficulty with the beginning of an emotional/ creative matter. Perhaps just short of an emotional expectation. In the ninth position: There may be too much activity in the Heart, Solar Plexus and/or Genital Chakras or in all three. There may be some discomfort, pain or the sweet pain of too much pleasure. The discomfort may come from these chakras being too closed rather than too open. In the tenth position: You will be either pushed forward at a faster pace or held back at a slower pace, in your Emotional Plane. Whatever is necessary to compensate for your potential behavior in the near future, you may say in the next year.